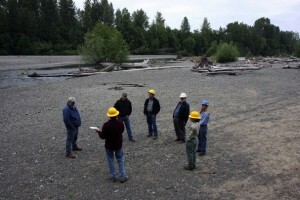 After years of hearing bits and pieces about an Army Corps of Engineers investigation of the Skokomish River ecosystem, it seems that things are now moving toward work on a variety of projects. Many are of the type and scale that one would associate with the corps. The public will get its first glance at 40 or so potential projects during an open house and slide show next Thursday beginning at 5 p.m. at the Mason County Public Works Building, 100 West Public Works Drive in Shelton. Review the news release (PDF 44 kb) on the event. The 40 or so projects to be presented at next week’s meeting are only at a conceptual stage. They must undergo further feasibility studies and cost analyses. A draft feasibility report and environmental impact statement are scheduled for release in August 2013. 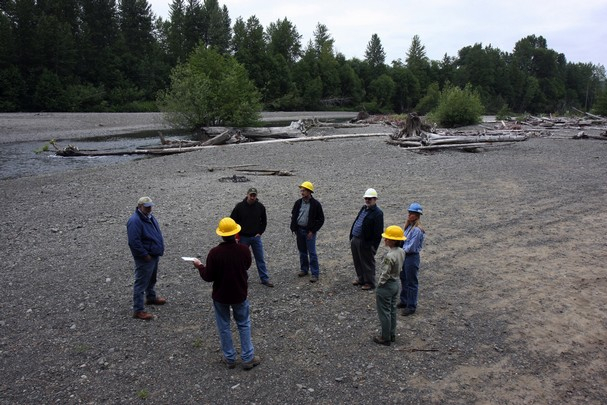 As I mentioned in January, the corps is no longer focused on controlling flooding in the Skokomish Valley. Still, much of the ecosystem-restoration work could provide some flood relief. See Kitsap Sun, Jan. 22, and Water Ways, Jan. 25. Projects may include adding salmon-spawning habitat and/or large woody debris, removing invasive plants, planting native vegetation, improving fish passage, removing gravel on gravel bars and spot-dredging. When I wrote my recent progress report on the Puget Sound Partnership, my story included little more than brief quotes and snippits of information from a variety of informed people. It is somewhat rewarding to have a blog where I can bring you more complete impressions of the people I interviewed. Here is the second in a series of expanded reports from those interviews. Dave Herrera, one of two vice chairmen of the Ecosystem Coordination Board, is one of three tribal representatives on the 27-member board. The other tribal reps are David Trout of the Nisqually Tribe and Randy Kinley of the Lummi Nation. Herrera currently serves as “fisheries policy representative” for the Skokomish Tribe. 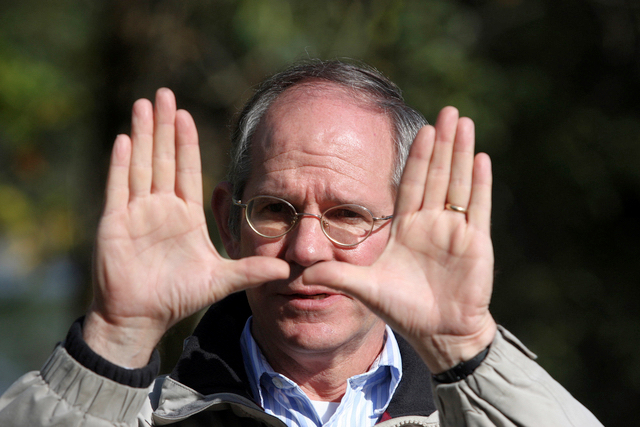 His career started with the tribe as a hatcheries technician in 1975 following the landmark Boldt Decision. He was 18. He worked as fisheries manager from 1979 to 1982 before leaving tribal employment. Dave later worked for the Northwest Indian Fisheries Commission and Point No Point Treaty Council before returning to the tribe in 1996, where he has remained one of the tribe’s top fisheries managers. Dave is a member of the Skokomish Tribe. His mother grew up on the Skokomish Reservation. His father was in the military, so Dave moved around with his family at a young age. He spent many of his early years in Tacoma. Herrera has been an excellent spokesman for the Skokomish Tribe and tribes in general. For the Puget Sound Partnership story, I interviewed him by phone while he was in Washington, D.C., working to advance salmon restoration. Unfortunately, I could not fit his comments into my final story, but I’m now pleased to report his views on the partnership. 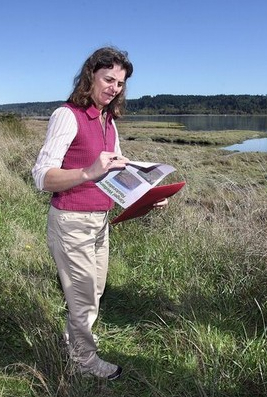 The Kitsap Sun’s “North Mason Life” reporter, Rodika Tollefson, put her own spin on the Klingel Wetlands story. She was able to interview Gary Parrot, who returned from an out-of-town trip, and was able to talk about the history of the wetlands. Last week, I had a rare opportunity to take a mental trip back in time. It happened twice, as I stood in two different Hood Canal wetlands and recalled the past while pondering the future. The first place was the Klingel Wetlands outside Belfair on the North Shore Road. See Kitsap Sun, Oct. 7. Sandra Staples-Bortner, executive director of the Great Peninsula Conservancy, considers changes coming to the Klingel Wetlands as she stands on an old farm dike destined for removal. “A great blue heron, its broad wings spread to the wind, dips out of an overcast sky and glides into the marsh. Extending its legs, the large bird lands gracefully among tall reeds near the water. The tweet-tweet-tweetering of songbirds creates an agreeable chorus, though each bird sings its own distinct song. Gary and Celia Parrot, who have kept watch over the property all these years, appreciated the need to connect people to nature. They helped me express a concept that I’m afraid is largely lost on our urban-based society. I’ve had to face the fact that environmental news continues even when I’m on vacation. I’ve managed to limit my time on the computer, to the delight of my wife, but I’d like to touch on a couple of issues now and catch up with others later. A little more than a week ago, the Federal Energy Regulatory Commission approved a new license for the Cushman Dam Project in the southern part of Hood Canal. This landmark approval has closed the book on a story I have followed my entire career, and news of the license decision was one of the last stories I wrote before I left for vacation. See Kitsap Sun, July 16. I’m told the license terms are essentially the same as those in the hard-fought agreement approved by the city of Tacoma, the Skokomish Tribe and natural resource agencies for the state and federal governments. As I’ve reported before, the agreement requires the city of Tacoma to fund some major environmental restoration projects and provide cash the tribe can use for various projects. On Jan. 13, 2009, in Water Ways, I spent some time going through this agreement section by section. I refer you to that entry for a better understanding of what this landmark agreement will mean to everyone involved. A story I missed as a result of being on vacation this week was the helicopter transport of some giant trees to the Skokomish River, where the trees will be used to build engineered “log jams” to improve habitat. John Dodge covered the story for The Olympian, and the Kitsap Sun picked it up from the Associated Press. I had a few more details about this project when I reported on the announcement in February. See the Kitsap Sun, Feb. 26. Washington state’s salmon managers provided so much interesting information on Tuesday that I could not fit it all into my story in yesterday’s Kitsap Sun. Pat Pattillo, salmon policy coordinator for the Washington Department of Fish and Wildlife, deserves recognition for his patience with me and the numerous sport and commercial fishers who ask him questions. He and WDFW Director Phil Anderson are two of the most mild-mannered guys you will ever know, and yet they manage to work through tough salmon negotiations year after year. Let me recount some of the issues expected to come up over the next few weeks, with a focus on things not covered in my story.